Yes, it's a social network. Also: Just a third of high school seniors place a call each day, and more teens report using Pandora than Instagram or Snapchat. What are the most popular social networks, apps, and websites for high schoolers? Niche asked. Seven thousand teenagers answered. Here are the results (click to enlarge). 1. Pandora? Pandora! I don't often see Pandora hailed as a Master of Attention quite like other apps that tech writers pay attention to. Maybe it's because Pandora is the background music—literally—to other activities and apps soaking up most of our attention. But the fact that more teens report using Pandora than Instagram, or Snapchat, or iTunes, or Netflix, is astonishing. 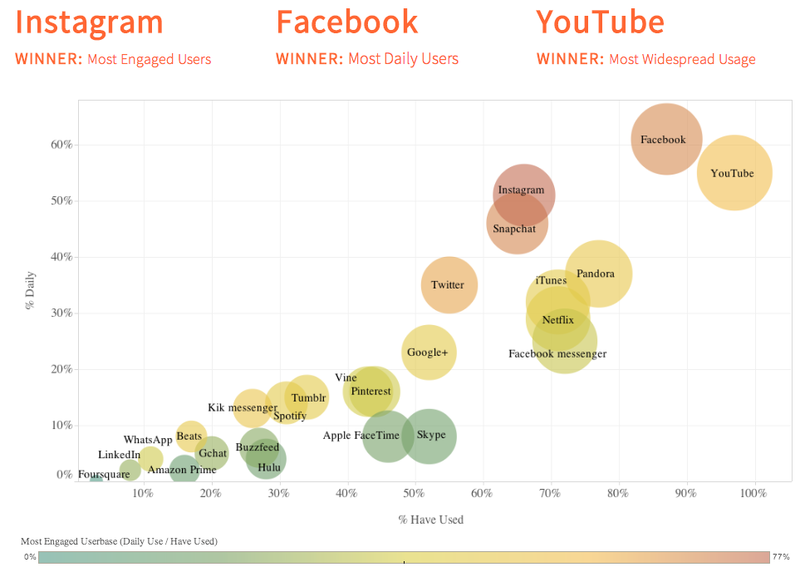 The second graph, on daily use, shows Pandora slightly behind Insta and Snapchat, but still ahead of Twitter, phone calls, and iTunes. You could try to shoo away my astonishment by saying something like "well, duh, teens love music" but that doesn't explain why Pandora's daily users are almost 4X Spotify, almost 5X Beats, and more than 6X Rdio—even though all those other services let you pick the songs you want to hear. Pandora is doing something very, very right, and it's still barely making money. Distributing music on the Internet, ladies and gentlemen: Great service, rough business. 2. Websites are much smaller than social networks. If you're confused why digital publishers obsess over Facebook and social media, make this graph your smartphone wallpaper. Even the most popular site among teens—BuzzFeed—has fewer daily visitors than any network or app in the graph. (Even Beats, which is considered a tiny music service, has more daily users than any website in the survey.) Seventy-three percent of teens don't read BuzzFeed, 84 percent don't read Reddit, and 96 percent don't read Mashable or Gawker. For young people, Facebook is the newspaper, and websites are the authors. As mobile attention flows to apps and away from homepages, the most important challenge for digital publishers becomes making their content sharable in competition with other sites' content. Content is king, but distribution is the kingdom. 3. Rumors of Facebook's death etc., etc. As regular as a solstice, every six months or so, we get another freak-out about Facebook's command of young people's attention. We can calm down, for now. Aside from YouTube, Facebook and Instagram (owned by Facebook) are the most popular apps in the country by daily users, and Instagram reported the "most engaged" users of any app in the survey. 4. Texting: The quiet king. I can't decide whether texting's dominance here is obvious or profound. By daily use, it's nearly three-times more popular than phone calls. Last week, PayPal president David Marcus jumped to Facebook to lead its messaging team, which made some people speculate about Facebook Messaging as a commercial network to send money between users. Maybe that interpretation is too small. Messaging is an everything network. It's identity, it's social, it's intent ("hey do you want to see Spider-Man"), it's location ("yo I'm in the theater"). It's the purest form of social network, so simply social that we scarcely consider it a network. But, with a lag, commercialization dependably follows our attention.